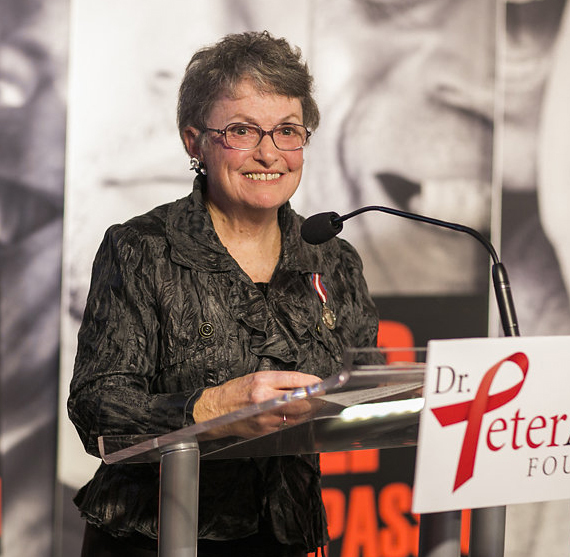 While Dr. Peter has been celebrated for his role in increasing the Canadian public’s awareness about HIV/AIDS through the Dr. Peter Diaries, less recognized is the extraordinary role his mother Shirley Young has played for more than two decades. After Peter’s death, in November 1992, Shirley worked tirelessly alongside her husband, Bob, towards building the foundation to carry out her son’s legacy. Between 1992 and 1994, Shirley and Bob ran the Dr. Peter AIDS Foundation from home, working with other AIDS service organizations to determine how best to carry out Peter’s wishes and the Foundation’s mission “to provide comfort care for people living with HIV/AIDS” and ultimately create a health care centre specifically for people living with HIV/AIDS who are most in need. The Foundation secured financial support from government and private individuals, opening the Dr. Peter Centre in an old wing of St. Paul’s Hospital in 1997. Then, on December 1, 2002 after a capital campaign, the permanent $9.2 million Dr. Peter Centre opened with a two-floor day health program and a 24-suite specialized nursing care residence. Now an Honorary Director, Shirley serves breakfast every Wednesday to the participants of the day health program and frequently visits with Dr. Peter Centre residents. She is known for her warm acceptance and hugs, which she gives generously to everyone at the Centre. Shirley continues to be an incredible inspiration to the clients of the Dr. Peter Centre and to families affected by HIV/AIDS.